1. an orthopedic appliance or apparatus applied to the body, particularly the trunk and lower limbs, to support the weight of the body, to correct or prevent deformities, or to control involuntary movements. See also orthosis. 2. (in the plural) orthodontic appliance. Milwaukee brace a brace consisting of a leather girdle and neck ring connected by metal struts; used to brace the spine in the treatment of scoliosis. Milwaukee brace. From Bolander, 1994. An orthosis or orthopedic appliance that supports or holds in correct position a part of the body and can allow motion at adjacent joints, in contrast to a splint, which prevents motion of the part. (brās) an orthopedic appliance or apparatus (an orthosis) used to support, align, or hold parts of the body in correct position; also, usually in the plural, an orthodontic appliance for correction of malaligned teeth. 1. An orthopedic appliance used to support, align, or hold a bodily part in the correct position. 2. often braces A dental appliance constructed of bands and wires that is fixed to the teeth to correct irregular alignment. 3. An extremely stiff, erect posture. 4. A cause or source of renewed physical or spiritual vigor. To furnish with a brace. an orthotic device, sometimes jointed, used to support and hold any part of the body in the correct position to allow function and healing, such as a leg brace that permits walking and standing. Compare splint. Any external device used to shore mechanically weakened or compromised musculoskeletal groups. Orthopedics A device that shores biomechanically weakened body parts. See Milwaukee brace. An orthosis or orthopedic appliance that supports or holds in correct position any movable part of the body and that allows motion of the part, in contrast to a splint, which prevents motion of the part. 1. An ORTHODONTIC appliance used to correct malposition of the teeth by exerting pressure in the desired direction. Sustained pressure on a tooth causes bone absorption on the side opposite that on which pressure is applied and bone growth on the same side. 2. An externally worn leg support needed when a leg is unstable from muscle weakness or joint disease, or a spinal support used to correct deformity such as SCOLIOSIS. 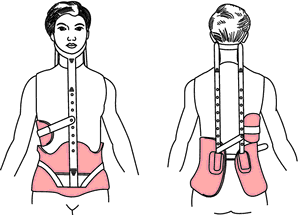 a support to maintain a part of the body in its correct position. An orthosis or orthopedic appliance that supports or holds in correct position any movable part of the body and that allows motion of the part. n an orthotic device to support and hold part of the body in the correct position to allow function, such as a leg brace that permits walking and standing. Sometimes used to describe orthodontic appliances. 1. an orthopedic appliance or apparatus (orthosis), usually made of metal or leather, applied to the body, particularly the trunk and lower extremities. Has limitations in animals as compared to humans. Used mainly for support for the lower limbs of horses. 2. the stance from which a polo shot is played. 3. a pair of animals. Zero Compression Back Braces objective is to help various people minimize their lower back employing straightforward and easy way. If you only have the use of one arm, this brace will allow you to shoot a "long gun handgun" much more safely and accurately. The Arthritis Foundation points to braces as beneficial in allowing ligaments to heal, relieving pain and providing a confidence boost, as wearers tend to feel more secure. I knew that as soon as they started to hurt, I would whip them out - so I needed braces that were firmly stuck on. Operating for over 15 years, Brace Shop distributes products worldwide to a range of industries including healthcare professionals, hospitals and clinics, government institutions, school sport teams and to the general public. The net force components applied by the brace and the linkage assembly displacements were measured. Comparing to the brace that was introduced by Imai in Japan our brace application is noninvasive. Until now, most studies of the issue have been observational and have yielded inconsistent results; only one prospective study has compared patients who wore back braces with patients who did not, the investigators said, (N.
The feedback we got from patients each time is that the brace made their knee feel more supported, they felt more comfortable, they felt more confident," he said. It's a good thing," a wide-smiling Brace said before shaking hands and sharing hugs with former teachers like Fran Weeks, Dan Rushton and Janice Corazzini, assistant principal Brian Dougal, and - of course - his old football coach, Chris Moriarty. Short brace heights often cause the string to hit the archer's forearm. London, Feb 6 ( ANI ): Mike Tindall, who made headlines for kissing his ex-girlfriend in a club days after his wedding, has revealed that he was wearing invisible braces when he married Zara Phillips.